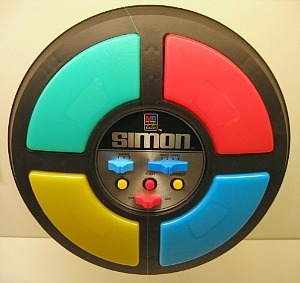 Simon was a very addictive electronic game that was launched in 1978 by Milton Bradley (MB Games). It quickly became an 80s classic and rather a lot of kids received a Simon game as a Christmas present during both the seventies and eighties. The idea is to remember the sequence of flashing coloured lights and sounds. This is a great game for testing your memory - how many rounds can you complete in the free version below?